A quick and easy almond flour bread that does not taste eggy. This recipe makes perfectly soft keto sandwich bread! Gluten free and low in carbs. I’ve made many keto bread recipes since I started eating low carb. 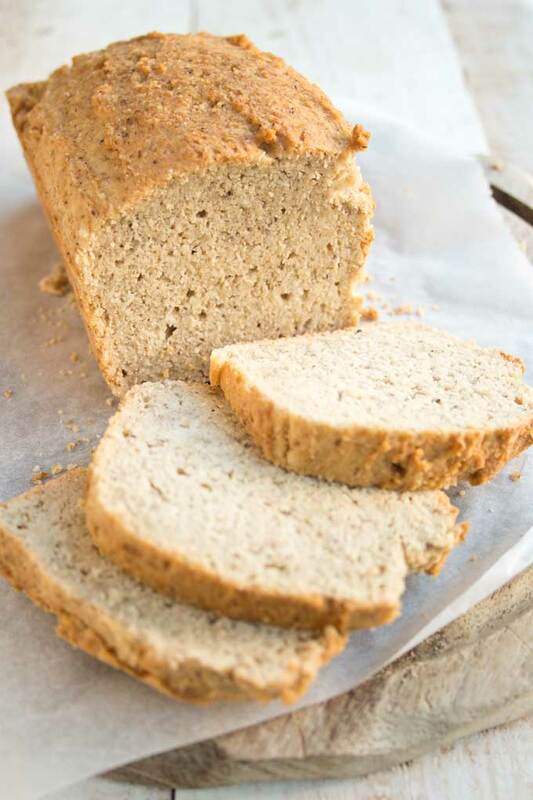 And I’ve got to say – this almond flour bread is one of my favourite recipes! It is such an easy recipe and requires only a few ingredients. I regularly use it as sandwich bread in lunch boxes, it toasts well and you can freeze it, too. What does almond flour bread taste like? Full disclosure here – low carb breads will never taste exactly like white bread or sourdough. You CAN taste the almond in almond flour bread. I think it has a pleasantly nutty and ever so slightly sweet flavour. This recipe contains psyllium husks. 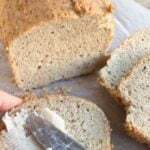 Psyllium does not only help with the texture, but also makes your entirely grain free loaf taste a bit like whole-wheat bread. Last but not least, psyllium is a fantastic source of fibre! This almond flour bread does not taste eggy!! Some keto bread recipes use as many as 7 eggs to help bind the dough. The result is a distinctive egg taste and weird spongy texture, which many people dislike (including myself). I used only 4 eggs in this recipe. And to prevent ANY eggy taste, I omitted 2 of the egg yolks, using only 2 egg yolks in the recipe. It works so well! This almond flour bread is fluffy and not spongy at all. And there’s one more secret ingredient that helps this bread have a texture that resembles regular bread: xanthan gum. 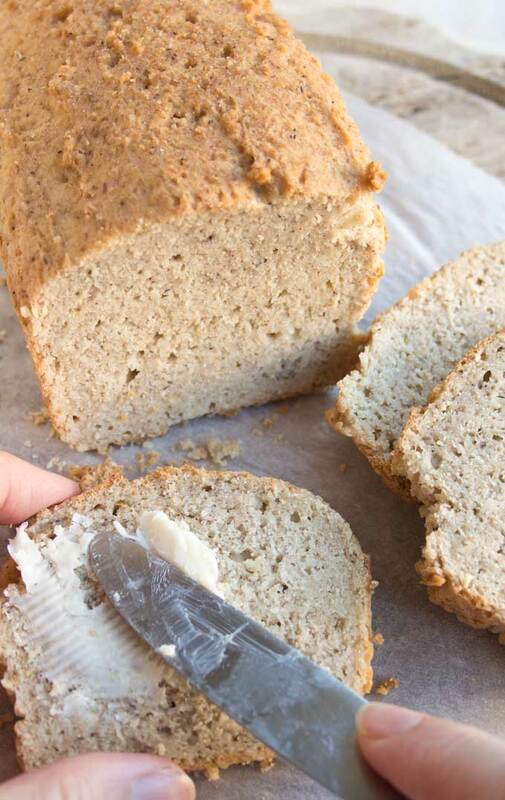 Low carb bread lacks the gluten which occurs in wheat, which can make it crumbly. 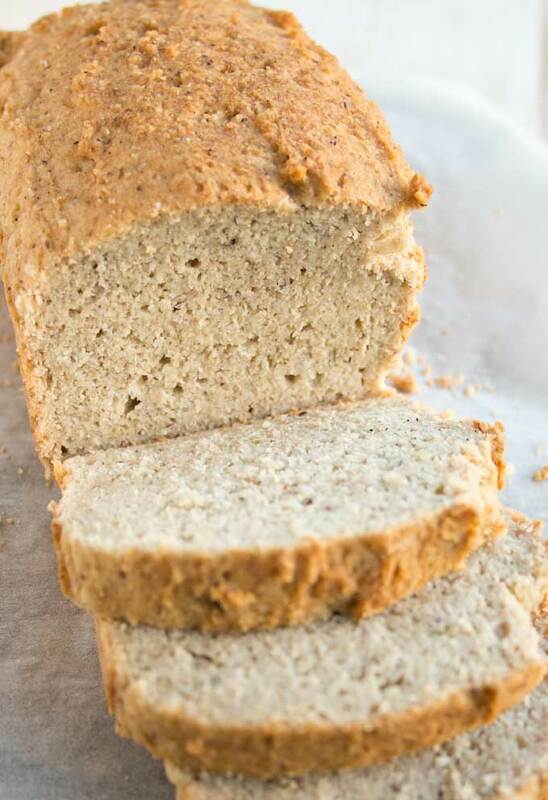 The xanthan gum gives grain free bread a stronger structure and a better crust. 1.) Crack 2 eggs into a bowl and add 2 additional egg whites. The recipe works best if the eggs are room temperature. 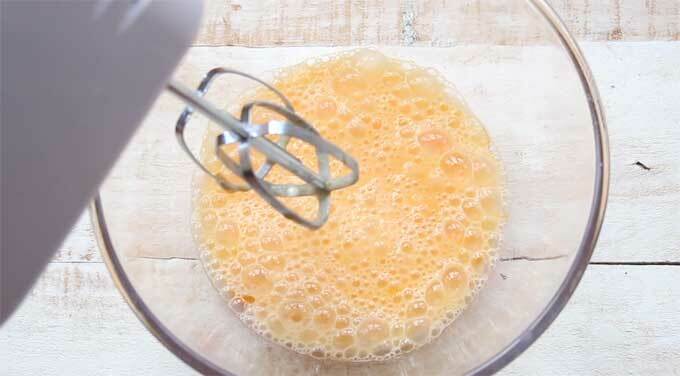 Whisk the eggs and egg whites for about a minute until frothy. Tip: Reserve the leftover yolks for a homemade mayonnaise! 2.) 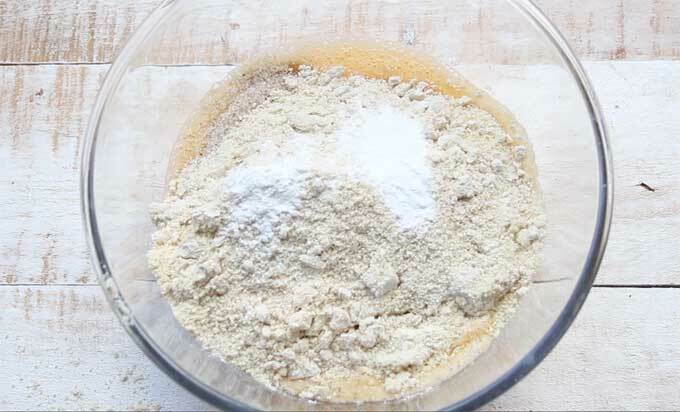 Add the rest of the ingredients – the psyllium husks, almond flour, melted butter, baking powder, xanthan gum, salt and warm water. Tip: If you don’t have xanthan gum, use more baking powder instead. 3.) Blend until you have a smooth dough. Don’t over-blend! 4.) 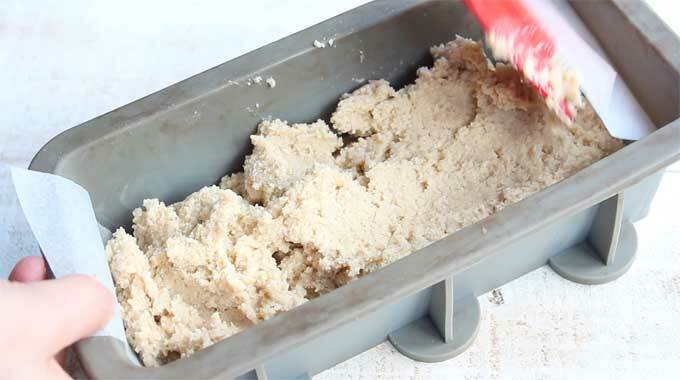 Fill the dough into a loaf tin lined with baking paper. If you don’t use a silicone loaf pan line ALL SIDES with parchment paper so the bread will release easily. Smooth the top, but don’t press down too much – keep as much air in the dough as possible. Bake at 180 Celsius / 350 Fahrenheit for about 45 minutes or until a knife inserted comes out clean! Is this almond flour bread recipe good for sandwiches? You can store your bread on the kitchen counter for a couple of days or up to a week in the fridge. I like to pre-slice my bread loaves and store them in the freezer. This way I can simply pop a slice in the toaster whenever I want one! 1.) Make sure your baking powder is fresh. Check the use-by date or test it by putting a little baking powder in a glass with warm or hot water (cold water does not work). If it fizzes, it’s fresh. 2.) Beat your eggs until they are frothy to get air into them. 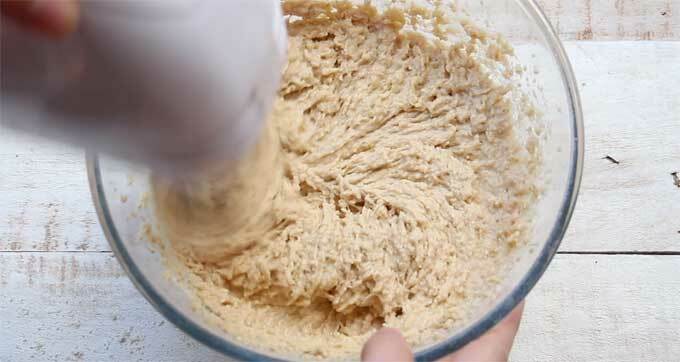 When you add the almond flour do not over-beat and the dough stays “airy”. 3.) Make sure your eggs are room temperature. If you use them straight from the fridge, the dough is colder, will take longer in the oven to heat up and this can affect the efficiency of the baking powder. 4.) For the same reason, use warm water and not cold water. If you follow these steps, you should be good to go! I have made this recipe with both very fine almond flour and with coarser ground almonds / almond meal. Both work well. The coarser your almond flour is, the more rustic and “country-style” your bread will be. I used whole psyllium husks in this recipe. The term is slightly confusing – they actually are not whole at all, but look like little thin sticks. If you want to use psyllium husk powder instead, you need to HALVE the amount stated. Make sure you have an eye on your almond flour bread when it’s in the toaster! It browns quicker than wheat bread. Info: You can buy the products I’ve linked to in the post above from Thrive Market. Thrive Market is an US based online store that sells all the products you need for low carb cooking at wholesale prices! If you become a member, you can get 25-50% off the best healthy and organic premium products for just $60/year. Click here to join and receive an extra 25% off your first order! This fluffy and easy almond flour bread has a texture just like wholewheat bread. It's fantastic for sandwiches and toasts well. Add the rest of the ingredients and blend until you have a smooth dough. Don't over-mix. 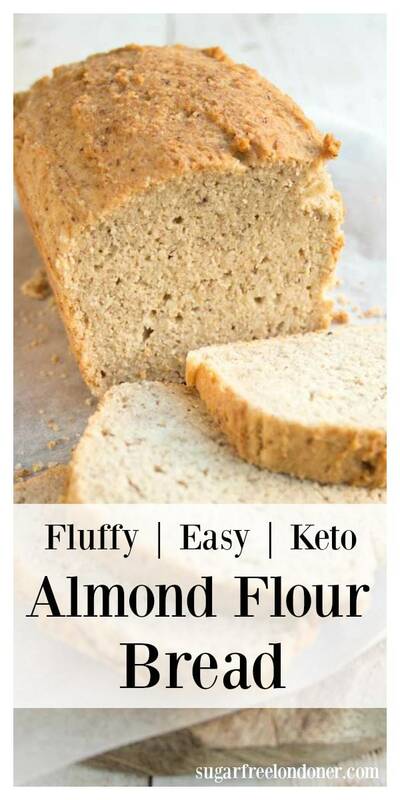 You can use a regular 9 x 5 inch loaf pan for this almond flour bread recipe. It will come out a bit flatter than your regular toast slice though. Low carb bread is filling and slices don't need to be the same size as regular wheat bread. That's why I purchased a small loaf pan like this for low carb baking. It's half the size of a regular loaf pan. Check after 35 minutes - if the top of the bread starts browning too much, cover it with a piece of aluminium paper. This will prevent the top from getting too dark / burning. I made this and totally loved it! I have tried so many low carb bread recipes but this is my favorite! Omg, love this bread!!! After not having bread for so long, this is an amazing substitute for the real stuff! I made it tonight, was very easy, baked a hair over 50 minutes, was worried it was going to be dry, but no perfectly soft, moist, nice crumb! Sliced it up while warm, with some Kerry’s butter, yum, I was in heaven! And yes, it does smell funky, must be the almond flour! No worries! I will be making this regularly, thank you so much! Not only is the recipe great itself but you have done a very good job of explaining how to get it just right. I have made it many times now and it is pivotal to my keto sustainability. I also add walnuts to the bread which gives it a nice touch. Thank you for putting this recipe up. Look forward to more recipes from you Katrin! That’s so good to hear. I like the idea of adding walnuts to the bread! You could give it a go, though it might not be super easy! The dough is a bit sticky (check the consistency in the pics), so I’d flatten it between 2 pieces of parchment. Maybe add a little more almond flour or use less water to get it into a rollable consistency. I tried for first time tonight. I accidentally used baking soda instead of powder, but it came out really well. I added some cinnamon and a couple fresh blueberries prior to baking for some extra flavor and sweetness. Warm out of the oven–very good. Looking forward to actual toast tomorrow morning! What is a substitute for psyllium husks in this recipe? You could try using flaxseed meal instead. I LOVE this bread. I’ve made it a ton of times and it never disappoints. In fact, my friend and I like this bread more than any regular grain based bread we’ve ever had. I do have one small problem and was wondering if anyone can tell me what I am doing wrong. No matter how many times I’ve made this bread, the loaf always comes out lop-sided; meaning, it rises on one side more than the other and I cannot for the life of me figure out why. I would love to include a picture to illustrate what I mean, but there is no option to do this. All I can say is one side of the bread rises out above the bread tin more than the other side. I use a smaller loaf tin lined with parchment paper and follow all of the baking instructions to the tee. Any ideas??? Hi Will, maybe your oven is hotter in the back than the front just like mine? Try rotating your bread half way through. I haven’t tried that, but it should work. I might add a little extra baking powder, to make sure it rises well. Also, the baking time would be quite a bit longer. Test it with a knife to make sure it comes out clean and cover the top with aluminium foil if it gets too brown! Made this and it is a REALLY GOOD keto bread recipe, and best of all absolutely no egg flavor. This recipe is a keeper. Thanks so much for sharing. Hi, this recipe is lovely but the only problem I find is that it’s quite moist, I’ve tried cooking for longer and tried reducing the water but still having the same problem. Do you have this problem? No, but ingredients differ, so you’re right to adapt. Reducing the water is an option, as is increasing the amount of almond flour, which is what I would do next time you give this recipe a go. It’s also possible that your eggs are much larger than mine, so you could even consider using one less egg. I would lov to bake this. I’m based in the UK. Do you know of any Uk-based store, where I can buy the ingrediences? Hi Carolina, I normally buy Sainsbury’s or Waitrose own brand ground almonds. Psyllium husk and xanthan gum you can get from places such as Wholefoods, Planet Organic or on Amazon. Thanks. I found everything on amazon. Made the bread today and it worked great! Hi! Thank you for the recipe! So good and easy! Is your Nutition facts per slice from a 9X5 inch pan? Nutrition is calculated on the basis of 12 slices per loaf. I’m thinking about adding some shredded zucchini for additional vitamins and moisture. Thoughts? Yes, that would be nice. You may have to reduce the water in the recipe as zucchini contains a lot of moisture. I followed the recipe exactly and my bread did not rise at all. What could I have done wrong? Should I have mixed the dry ingredients with a spatula and not a hand mixer? In the picture it looked like you used a hand mixer. The taste is good (I may add a bit of sweetener next time) but it’s dense and not risen at all. Please help me! 2.) beat the eggs until they are frothy (get air in that dough), then don’t over-beat when incorporating the almond flour. Any mixer is fine. 3.) baking powder needs to be fresh. If it’s out of date/too old, bread won’t rise. you can test this by putting a bit in warm or hot water (not cold water!). It should fizz. 4.) the water you use for the recipe needs to be warm! Oh WOW!!! I just made this using EXACT recipe and directions!!!! Do not deviate from the directions! It doesn’t taste “eggy” AT ALL like the other recipes I’ve tried!!! Kudos, as this is Hands Down the best Game-Changer keto bread Ever!!! So glad you like it Teressa! Success! I made sure the eggs were room temp and beat them until super frothy and after the dry ingredients only until just incorporated. The bread looks soo good! I was wondering, have you tried beating the egg white separately until soft peaks and add in beaten egg yolks and then add other ingredients? Do you think it could work that way as well? I want my bread to be super fluffy lol. My bread did rise but not above the tin. Is that what’s to be expected? Yes, beating the egg whites until semi-stiff could trap even more air and result in fluffier bread. If you try it, can you let us know how it went? I’d be super interested to hear. As for the rise, it really depends on your tin. If it’s a large (regular) bread tin, your bread would probably not rise above. If you use a half-sized (ca 500g) tin, it should. This recipe is a game changer. I followed the recipe exactly as it was. Delicious! Closest thing I’ve tried that resembles real bread. I am having toast this morning and it’s amazing! I will be making one loaf every Sunday. Thank you! Your keto app tracker is right. The 4.1g are total carbs, you have to subtract the fibre. Can eggs be replaced with oil or additional flax seed meal or any other ingredient in this recipe? I Am allergic to eggs and looking for an alternative option. To be honest, I don’t know. You’d have to experiment a bit – I do know you can replace eggs with flax eggs – a mixture of flax and water. Maybe you need to use a bit more baking powder to make it rise? I would love to make this bread, but I can’t get psyllium husk here. I live overseas, is there anything else to substitute? I do have Almond Flour. Most of the stores here in Austin Tx (USA) are carrying physillium I’ve been drinking this for more than 10 years and it helps with getting a clean colonoscopy. Thanks for incorporating this in an awesome recipe. I’ve made this bread a number of times. It’s really easy to make and has turned out successfully each time! I really enjoy it! I made this today. I used goats butter as I have a dairy intolerance. Because I didn’t have enough almond flour, I topped up with buckwheat flour. This will probably not make it low carb, but I don’t mind. I will be making it again as soon as I have stocked up on almond flour. Can this be made in one of the electric bread machines? If so, would there be any modifications needed such as adding yeast and a sweetener like Swerve? Hi David, I wish I could help but I really don’t know as I have never owned a bread machine!! I’ve made a couple of keto breads and this one actually brought tears to my eyes it was so close to eating proper bread again!! You made my day with this comment! Thank you fo trying out my recipes and supporting Sugar Free Londoner! Hi Andrea, I don’t have a bread machine so I really don’t know what settings you’d need for this recipe. The flavor is great. I waited for the loaf to be completely cooled and used an electric knife to cut it. The top 1/4 inch fell off every slice except the ends. What did i do wrong? Apologies in advance for having to be brutally honest about this recipe, but I think people should be aware of the potential for disappointment. I made the recipe exactly as you described and it looks just like your pictures. First, it tastes nothing even close to the realm of real bread. While it doesn’t taste eggy as you described, it has the smell of fried eggs or omelette, especially when warmed or when you attempt to toast it, and smell is an essential part of taste. The smell is off-putting when you are wanting a bread taste. Second, the bread came out spongy and has the consistency and texture of a soft cornbread or dessert bread. So nothing at all like real bread. It even tastes somewhat sweet which most people do not want in bread. Finally, the bread has a buttery feel and leaves your fingers slightly greasy. Regular bread doesn’t do that. For those looking for a somewhat close to real bread substitute I would avoid this recipe. No more than one egg should be in bread unless you are making challah or similar, and it seems like all keto bread recipes require a lot of eggs. It’s not bread it’s something else entirely. This bread recipe has only 2 yolks and still smells eggy. For those, like myself, wanting a low-carb real bread I would recommend a proper low-carb yeast bread recipe with vital wheat gluten (the vast majority of people have zero gluten sensitivity, so the gluten-free fad is at best a waste and at worst a scam). Such breads have approx 1.5-2 grams more net carbs per 40g slice (5-6 grams total net carbs) than this recipe and I think it’s worth it. This is my favourite low carb bread and I make it regularly. I completely disagree – it does not smell of eggs at all and the texture is just like a soft wholewheat bread! It toasts well and I use it to make lunchbox sandwiches. It’s a 5* recipe for me!!! AMAZING BREAD! Made it today and said if it was not good I was going to stop trying anymore low carb recipes! It is delicious and I can’t thank you enough for sharing the recipe! Hello Sharon, that’s great news! I’ve tried my fair share of low carb bread recipes and I know how disappointing it is when they don’t work out the way you hoped for. I’ve got a few more bread recipes on my site, so I hope you’ll try them too 🙂 Happy new year! I just tried this a couple of days ago and subbed the husks for flax powder at 2 T. Though I could “slightly” taste the flax, it’s the best texture and non-eggy Keto bread I’ve tried to date. I’m living foreign and couldn’t get the husks but had flax on hand so it worked alright. Very easy to make and was quite good with my pasta-less lasagna. Your bread recipe is the first recipe which turns out like bread! I was so excited. I loved the texture and the smell. Even though i wasn’t using a mixer, it’s still very delicious. Even more delicious when i toast it whenever i wanna have a slice. Can’t wait to try the rest of your recipes. Thanks Katrin. p/s: i didn’t have xanthan gum, so i replaced with arabica gum. Are the calores per serving? Or how are the calories calculated? yes, the calories and all other nutrition is calculated per serving – per slice, in the case of this bread. I cut my loaf into 12 slices. Hi, thank you so much for the recipe. It is so yummy, my toddler loves it. The one tho, my bread turned out to be cakey. Any suggestion? First of all, almond flour bread will never have EXACTLY the same texture as wheat bread because it lacks the gluten. It will be slightly softer. But. Baking with almond flour is never an exact science. If your almond flour is coarser, just add an extra couple of tbsp next time and the bread will be firmer. Or try reducing the amount of water so it dries out more. I would not recommend changing the amount of egg (unless you used extra large eggs). Hope this helps! I just want to say that I love your blog and am in love with your brownie recipe!! It’s a godsend and I was just as excited with this recipe as a result. Unfortunately, my bread fell short for some reason..No matter how long I toast it, it’s spongy and moist in the center…I’ve done everything as directed but substituted the butter for coconut oil. I measured it exactly too. Could that be why the bread is awfully wet in the middle or is there another reason? I tasted quite a bit of the psyllium husk as well which was okay..I’m thinking of making it with flax seed next time. What and how much sweetener would you add to make this a cinnamon swirl bread? Thanks! I made the loaf last weekend and it was fantastic! Can this be made into rolls for Thanksgiving? Yes, I think that should work! The dough is quite firm. You may need to reduce the oven time. Hi, can I just check – does the “Total Carbohydrates 4.1g” refer to the total for the whole loaf ? No, it’s 4.1g per portion. I always calculate the carb count per serving. Love your almond bread – the whole family does! Just want to check if serving size is based on one or two slices? Thank you! It really depends on how thick your slices are. I worked out the nutrition on the basis of 12 servings per bread. Nutrition is calculated per 1 serving. What is the portion size though? 1 or 2 slices? I have just tried this recipe and I am so pleased with the result ! I am not a confident baker but the recipe is quite easy to follow. I now have bread that I can use for sandwiches and looking forward in particular to toast for breakfast tomorrow. You have made me so happy as I was beginning to think that I would not be able to find an edible low carb/gluten free /dairy free bread. Not eggy at all and a lovely soft texture. I made it with the coconut oil as a dairy free alternative and the taste of the coconut is quite pronounced. I was interested to see that someone else used olive oil . Do you know what amount of olive oil would be appropriate ? Thank you again, I will be trying out your other recipes now that I have found your website. Hi Maria, glad you like the bread! Good question about the olive oil – on the one hand using the same amount as butter would mean you stick with the same wet/dry ratio, on the other had olive oil doesn’t firm up at room temperature, but butter and coconut oil do. Therefore, I’d try using a bit less olive oil than butter, maybe 40g instead of 60g. You could also get hold of refined coconut oil, which does not have the coconut taste, for example this one. That’s wonderful, would that be 60g of the coconut oil ? Thank you so much, I am looking forward to trying the recipe. Would this work just as well with a dairy free spread instead of the butter as I cannot tolerate dairy ? Sure, it should work just as well with coconut oil, for example. HI,the recipe looks wonderful. I am on a dairy free diet. Would the recipe work with 60g of a dairy free margarine in place of the butter ? Hi Maria, if your margarine is suitable for baking, it will definitely work. I just made this today. If I lived in London and could hug you, I would! You have NO idea how many recipes I’ve tried for almond flour bread and they never come out right or taste very good. This recipe is amazing! Since I can’t use psyllium due to an allergy to it, I used ground flax seed meal instead. OMG, this bread is delicious! I used the small loaf pan like you did and it came out perfect. It rose above the pan and is a perfect loaf. I let it completely cool, cut it with a bread knife and it did NOT fall apart, something so many of these type of breads do. AND it does NOT taste eggy which has been another problem I’ve dealt with. The loaf is so pretty! I can’t wait to experiment with different spices or herbs in this bread. Another plus for me is that since the slices are smaller than regular bread, it helps with calorie control when putting things on it for a sandwich. I have a strong wheat intolerance and don’t do well with grains in general so I’m always looking for alternative recipes. Thank you from the bottom of my heart. You just made my day!!!! What a wonderful comment to wake up to! You just made MY day. I think experimenting with different herbs and spices sounds like a great idea. I’ve also been meaning to make bread rolls with this recipe. I just made this. I doubled the recipe and used long narrow Wilton pans. I used carton egg whites. I baked it for 45 minutes, turned the oven off and left it closed for 30 minutes. Awesome, awesome, awesome!!! I now have 21 slices of bread in the fridge to experiment with. (That means I already ate 3) Thank you, Katrin! I just made it today . Love it.put a little honey on it. Still warm. Hi there! I too want to try doubling this recipe. Do uou think I can use regular/larger sized loaf pan using your same baking time-frame of 45 plus 30 mins?? How many net carb for 1 slice? I made this bread a few weeks ago. I sliced it and put in the freezer, and lifted out as I needed it. It makes a great breakfast with peanut butter. I have finished it and will be making another loaf. I just made this and smells and tastes great but didn’t rise at all….I didn’t have psyllium husk but used flaxseed…..I haven’t made a lot of bread but they have never risen like the photos… I’ll keep trying! This bread is excellent and easy to make. Blended by hand and it was still superb. Thanks. Loved this bread!! We add sesame seeds on the top and the bottom before baking. You may want to add the salt to the recipe. It shows in the video, but it is not listed on the recipe. I like the idea of sesame seeds, especially on the bottom! And thank you for letting me know that I forgot about the salt. I’ll add it to the recipe. Thank you for this great recipe. I used a 6 x 3.5″ pan as recommended, and fully lined it with parchment. It was perfectly baked at 45 minutes.I love the flavor and it is also great toasted. I do a lot of keto baking and this is the first time that my bread has not been spongy. I got 14 slices from my loaf, and froze half of them. Thank you. That’s great! Thanks for your comment. Glad you like the bread! How many slices do you usually make out of one loaf? Is one or two slices a serving? I am trying to calculate for a sandwich. Thanks so much. Love your recipes! So yummy! I made this bread last weekend and topped it with a handful of sesame, pumpkin and sunflower seeds. Will definitely be making it again. I didn’t have butter so used a mild olive oil instead. Worked a treat. Thank you for a great recipe! Hi Barbara, thank you for your comment. Good to know that olive oil works well, too. i just made my own bread following your recipe, it was really easy and quick. i used more baking powder instead of xantham gum and everything else was just like your recipe. Please, inform me about what should i do better or how could i avoid this eggy smell and taste. Hi Marianna, almond flour needs more eggs than regular flour. You could try with one less egg, but I think it might not be enough, unless you used more psyllium and flaxseed. Instead, you could try leaving out the other 2 egg yolks and replace with 2 tsp of olive oil. Hope this helps! I don’t have phsyllium husk do I have to use this? This looks like something my Fiancee would enjoy. Will definitely be making this for her to enjoy!